The Roofs fully complies with current building regulations. 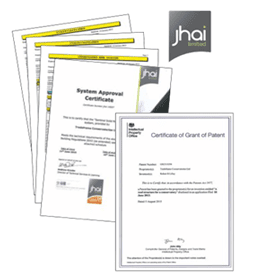 The solid roof is independently tested and certified by JHAI, an accredited national building control approvals agency. These tests involve detailed analysis and verification of the roof system from independently sourced structural calculations figures, along with further assessment checks on thermal performance and condensation resistance. As a result, the roof has been certified to achieve a ‘U’ value as low as 0.18Wm2. Designing roofs in timber combat the risk of condensation in a way that similar metal structures cannot. A letter dated 30th July 2013, and issued by the Department for Communities and Local Government. “in certain circumstances an existing conservatory or porch can no longer be considered exempt from the requirement of Building Regulations if the amount of glazing in either the walls or roof is significantly reduced by further work or alteration”. Percentage reduction is not clearly stated so we advise to check with your local building control office or get advice from your installer. Existing conservatories are likely to have been built either with prior planning consent or under permitted development rights. If the roof of an existing conservatory is to be replaced with a tiled roof similar to those on adjoining buildings and the overall footprint and height are to remain unchanged it is unlikely further planning permission will be required. In all cases, it is advisable to check with your local planning department before any of the works start. The unique and innovative design of the solid roof incorporates patented (patent number 2515294) timber pod technology. The patented protection should provide consumers with the peace of mind to know they are receiving a proven tried and tested original British designed product.